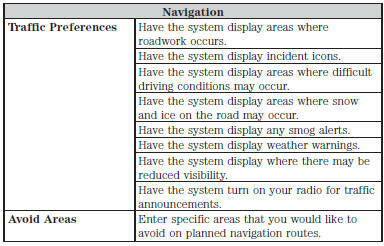 Under this menu, you can set your clock, access and adjust the display, sound and vehicle settings as well as access settings for specific modes or the help feature. Note: You cannot manually set the date. Your vehicle’s GPS does this for you. Note: If the battery has been disconnected, your vehicle needs to acquire a GPS signal to update the clock. Once your vehicle acquires the signal, it may take a few minutes for the update to display the correct time. 1. Press the Settings icon > Clock. 2. Press + and − to adjust the time. 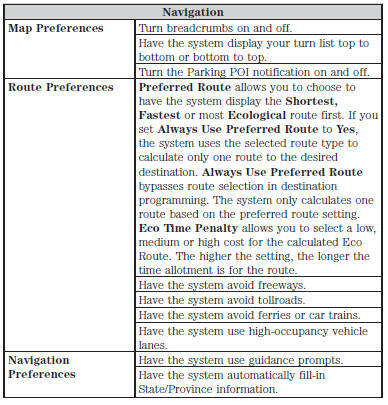 From this screen, you can also make other adjustments, such as 12– or 24–hour mode, activate GPS time synchronization and have the system automatically update for new time zones. You can also turn the outside air temperature display on and off. It appears at the top center of the touchscreen, next to the time and date. The system automatically saves any updates you make to the settings. You can adjust the touchscreen display through the touchscreen or by pressing the voice button on your steering wheel controls and when prompted, say, “Display settings”. Press the Settings icon > Display, to access and make adjustments using the touchscreen. • Brightness allows you to make the screen display brighter or dimmer. • Auto DIM, when set to On, lets you use the Auto Dim Manual Offset feature. When set to Off, screen brightness does not change. • Mode allows you to set the screen to a certain brightness or have the system automatically change based on the outside light level, or turn the display off. • If you select AUTO or NIGHT, you have the options of turning the display’s Auto Dim feature on or off and changing the Auto Dim Manual Offset feature. • Auto Dim Manual Offset allows you to adjust screen dimming as the outside lighting conditions change from day to night. This feature also allows you to adjust screen brightness using the instrument panel dimming control. • You can have your touchscreen display the default photo or upload your own. You cannot load photos directly from your camera. 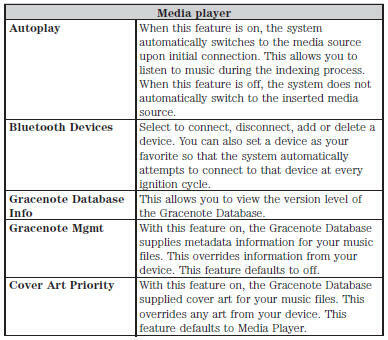 You must access the photos either from your USB mass storage device or from an SD card. Photographs with extremely large dimensions (such as 2048 x 1536) may not be compatible and appear as a blank (black) image on the display. Your system allows you to upload and view up to 32 photos. , and then follow the system prompts to upload your photographs. Only the photograph(s), which meets the following conditions, display: • Compatible file formats are as follows: .jpg, .gif, .png, .bmp. • Each file must be 1.5 MB or less. • Recommended dimensions: 800 x 384. 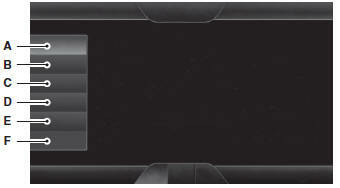 When activated, ambient lighting illuminates footwells and cupholders with a choice of colors. To access and make adjustments: 1. Press the Settings icon > Vehicle > Ambient Lighting. 2. Touch the desired color. 3. Use the scroll bar to increase or decrease the intensity. To turn the feature on or off, press the power button. Turn Automatic Reminders on and off and set the mileage interval at which you would like to receive the reports. Press ? for more information on these selections. When done making your selections, press Run Vehicle Health Report Now if you want your report. To change the keypad code for your keyless entry keypad system: 1. Press the Settings icon > Vehicle > Door Keypad Code. 2. Enter your current factory code, then, when prompted, enter your new code. This menu allows you to access settings for your rear view camera. Valet mode allows you to lock the system. No information is accessible until the system is unlocked with the correct PIN. 1. Press the Settings icon > Vehicle > Enable Valet Mode. 2. When prompted, enter a four-digit PIN. After you press Continue, the system locks until you enter the PIN again. Note: If the system locks, and you need to reset the PIN, enter 3681 and the system unlocks. 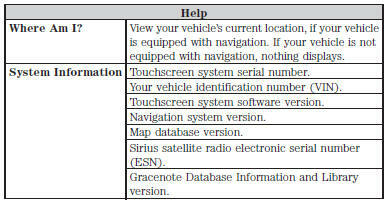 Access and adjust system settings, voice features, as well as phone, navigation and wireless settings. 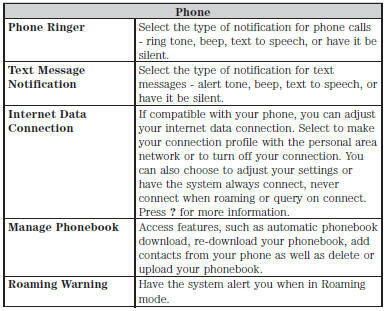 Your system has a Wi-Fi feature that creates a wireless network within your vehicle, thereby allowing other devices (such as personal computers or phones) in your vehicle to speak to each other, share files or play games. 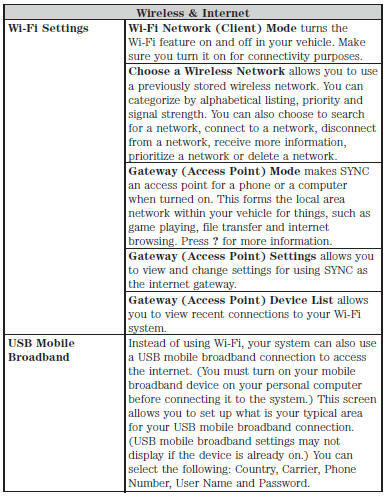 Using this Wi-Fi feature, everyone in your vehicle can also gain access the internet if you have a USB mobile broadband connection inside your vehicle, your phone supports personal area networking and if you park outside a wireless hotspot. 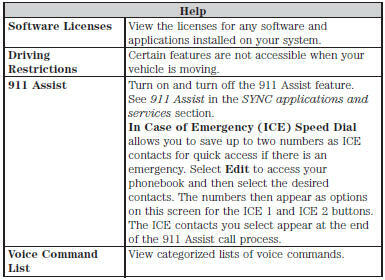 To access Help using the voice commands, press the voice button, then, after the tone, say “Help”. 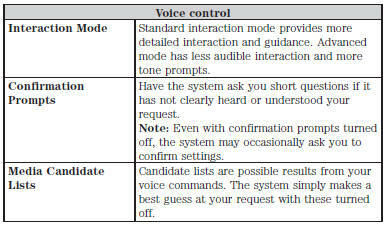 The system provides allowable voice commands for the current mode.